Star Kendrick and Toma Banjanin are not just another dream-pop duo trying to steal your breath away. Instead, as Geowulf, they’re crafting music that can be best described as escapism – pop that is exhilarating, stunning, and takes you momentarily away to an exotic world. In other words, it is pure bliss. At the same time, the duo are writing thoughtful and immediate stories. All this is revealed on their terrific debut album, Great Big Blue. Given it’s spellbinding nature, Great Big Blue should come with the warning to not operate heavy machinery while listening. The dazzling effects are best summarized by Kendrick on the summery “Saltwater”, on which she sings, “Come to the water / Let it wash you over”. Although on this song and many others, such as “Get You” and the shimmering “Greatest Fool”, Geowulf’s music is gratifyingly overwhelming. Opener “Sunday”, however, has a different impact – one that combines stunning arrangements with thoughtful lyrics. Like most weekends, Kendrick crafts a song full or memory, as she reminisces about what has happened. At the same time, she cleverly offers a reminder that everything must end, yet at the same time something new begins. Her songwriting may be the most overlooked part of Great Big Blue since Banjanin and crew consistently build enormous swells of blissed-out dream-pop. For instance, “Only High” features an enrapturing crescendo that verges on mind-altering. Kendrick quietly delivers a story of a collapsing relationship, where the two slowly become strangers. 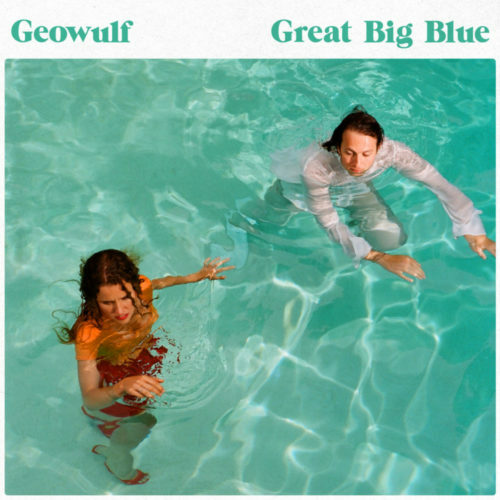 Similarly, Geowulf sweep you off your feet with the infectious and upbeat “Drink Too Much”. It is escapism personified, and an experience that could last for hours. Beneath the song’s stunning sheen, however, is a story of weakness and vulnerability. Kendrick shares a tale of a woman whose escapism is found in alcohol, which allows her to escape and pretend another reality exists. The song is wonderful on the ears, but it is an awakening of the mind. There is also much more to Geowulf’s artistry, such as on “Won’t Look Back” . An ’80s-inspired, synth-pop fills this number that has Kendrick peering into her subconscious to understand the emptiness in her heart. The sumptuous “Hideaway” is another Matryoshka number, whose layers run far deeper than one would expect. The shimmering pop approach sounds like summertime in the ’70s. As Kendrick’s sweet vocals further make you fall under Geowulf’s spell, her lyrics are what pull you in. At first, the track sounds like a typical story of want and lust. On the contrary, it is the undying love of a friend, parent, son, daughter, or partner, who is trying to connect with someone extremely dear. That person, however, is off in a distant place and living in their “own cave” and not allowing anyone to enter. Tropical vibes collide with brooding indie rock on “Summer Fling”, which is a smart anti-summer anthem. Like “Hideaway”, this song isn’t about hooking up nor rekindling an unlit flame. On the contrary, Kendrick reveals the devastation and mental anguish that comes with being used as nothing more than a play thing. “Raised on a stool too high, it’ll hide you from your wife. My enduring eyes, it was never going to work. Too much to gain and way too much to lose. Summer fling took its toll on me. Despite the escapism that fills Great Big Blue, there is undoubtedly an element of reality. For all the bliss that fills the air, pain and uncertainty are also present. These dichotomies reveal Geowulf’s true artistry, as they’re not just another band creating heavenly music. They’re also a band making us realize that our problems are shared by others. In this sense, Geowulf are like our best friend, offering some solace during these difficult times and moments of weakness. Helping us to remember that better days are ahead. Great Big Blue is out on 37 Adventures. Purchasing and streaming links available here.